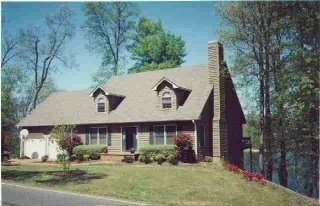 Lakewood community/Tennessee lakefront properties: Lakewood update and new listing!! Just wanted to update this blog with the new listing today on the water and the sale of 60 Juniper Circle. Juniper Circle closed sale today at $128,500(with owners paying part of the buyers closing costs) . Remember this home has living area of 1600'. That is a sold price per sq ft heated area of $80.31. Prices are going up!! Now for the house just listed on the water at Lakewood. This home is a 4 bedroom, 4+ bath home with basement built in 1992. This beautiful home sits on 1.2 acres. Amenities include a fireplace,large jet tub, 2 decks, lake frontage and of course a great view of the lake. This home is priced at just $218,500 which is a price of $50.58 per sq ft heated area. This is just what you Florida people have been asking for so first come first serve!!!!! !